TL;DR summary: Use the form below to enter a giveaway for free DLC! A week from now the biggest European truck show - the 66th IAA Commercial Vehicles expo - starts in Hannover, Germany. We are going to walk the show floor in force, trying to network with manufacturers and taking as many reference photos of every interesting vehicle as we can. Before the show starts, we're planning to release a couple of DLCs as a bit of a social experiment. We hope that it might turn into something of a case study on the engagement of the truck sim fan community in the industry as a whole; which would make a great talking point that we can use when we approach brand owners and try to teach them about the benefits of having their officially licensed products appear in our games. 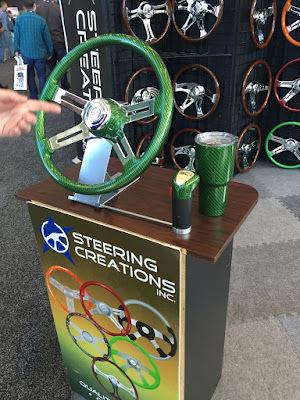 We are about to launch a huge giveaway of activation keys for the Steering Creations Pack DLC - in fact, we're offering a whopping 30 thousand keys to American Truck Simulator players. To qualify for this time-limited giveaway we're asking you to visit or follow American Truck Simulator and Steering Creations on Facebook and Twitter. If you're among the lucky first 30,000 you'll get the Steering Creations Pack for free! Meanwhile on our end we can measure the impact of this test and if our 'experiment' garners enough attention it will give us one more argument to bring to the table during licensing discussions in the future. Have fun!